Ever curious how much I spend on groceries? I don’t usually like to share the specifics of numbers any more when it comes to budgets, especially with groceries. Why? Because grocery prices are not apples to apples (see what I did there?) from one part of the nation to another. Plus I have international readers. Plus I have readers with young children, readers with many children, readers with no children, readers with adult children…just all sorts of readers. We all live in different places with different food sources and different situations. So talking about grocery budgets and comparing numbers is not always beneficial. Still, people are often very curious about how much I spend on groceries to feed my growing family full of teenage boys. I don’t blame them. Whether it makes sense or not, it is kind of fun to talk about grocery spending and compare notes about what works for people. Especially if any of us can gain insights on more ways to save money on healthy food purchases. So here’s the big fat truth about my real food grocery budget as I feed a houseful of growing teenage boys. There is a comma in this monthly line item. I used to feed the six of us for less than $500/month. Then our boys doubled in size and so did the amount of money it takes to keep them fed. Our current monthly grocery spending ranges from $900-$1,200. I mean, that’s a lot of money every month on food. But it’s food. The really good kind. My family is eating it heartily and staying relatively healthy. Because we homeschool and work from home, we typically eat all three meals at home each day, every day of the week. When I average it out, I see that we are spending between $5-$8 per person per day to eat very well. Could I cut back on our grocery spending? Yes, but not by much. I’m not just throwing food into my cart at random. I’m carefully price-matching each week, strategically buying in bulk, cooking from scratch – doing everything I can to spend wisely and frugally. We just eat…a lot. Plus, we love to have people into our home for meals. Our grocery money is money well spent, and I’m thankful. Last week’s grocery run cost $78. Most of this food was price-matched. Not bad, eh? Yeah well, the week before that I spent about $500 between Bountiful Baskets, Azure Standard, and Amazon. Now let’s not even talk about car insurance for teenage boy drivers. That is a whole ‘nother conversation and it isn’t pretty, nor is it fun like strawberries and beef roasts. Boo, hiss, car insurance. I curl up into a ball at this subject. Please, let’s go back to talking about happy things like green beans. The verdict is still out on whether or not our budget will see a big difference with our oldest son moving out and eating most of his meals in the college cafeteria. So far there’s not been much change – but I do predict that our spending average will go down a little bit. I mean, just last week I only had to double our pancake recipe instead of triple it, so that right there was a $1 saved. I think I’ll start saving for a cruise. Or just apply that dollar to his college tuition. Below is a list I posted about a year and a half ago about ways I save on real food groceries. I can’t imagine what our budget would be if I didn’t continually work to save money in these ways. There would definitely be a 2 in front of the comma. Have mercy. 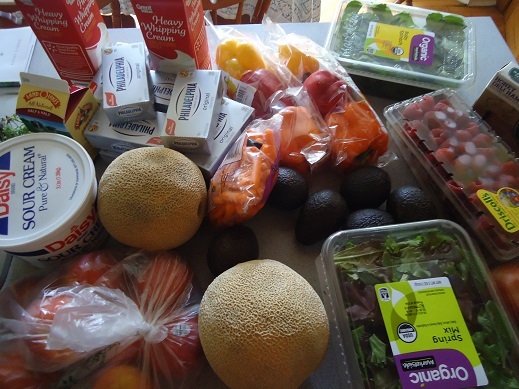 Want to share your grocery budget numbers? Have you seen your grocery spending increase as your kids got older? For those of you on the other end, have you found it difficult to adjust to buying less once your kid leave home? I will not even know how to cook in small quantities a few years from now. An 8×8 inch dish? Yes, I think I have one of those in the back of my cupboard. I still spend a significant amount on groceries every month because of all the very starving teenage boys at our house. But to my surprise, I’ve noticed significant grocery savings while following our Simple Meals plans. I love this so much. I mean, I knew it would save money, but this much? I believe it. I can still stick to $500 occasionally, but only by using up any stock of stuff in the pantry and freezers, which then increases my bill the following month. And not counting our monthly usage amount of our yearly side of beef. We are a family of 7 and it takes a lot to feed these kids. I also use a combination of Azure Standard, Bountiful Baskets, local farmers, Aldi, and our local Green Acres Market, as well as growing some items. Thank you. I would like to propose that although all that you mentioned above are technically groceries, at least part of the meals you prepare for those outside your family should be classified as “giving/offering” (not tithe), but as you serve others for the Lord, I would just personally budget that as a family ministry line item. May God bless you for opening your home & heart to others! Yes, technically that would be correct. Also add a line to the budget for $ saved by eating at someone else’s home. Then separating out those foods fed to friends needs to be done. They ate an apple? That’s $.53. One portion of a delicious breakfast casserole? $.93. As a former CPA and the keeper of our family’s budget, the value of my sanity and not keeping such an exact budget is priceless. My “Goal” for feeding our family of 5 (incl 16, 14, 10 year old boys, all in martial arts) is under $1,000/month. I never reach that goal, however. Usually it is in the $1000-1200 range, in our major metropolitan area. We use Azure, a local meat market, and a regional grocery store chain. All of our meats and dairy are organic, which affects the total budget. We rarely have leftovers, and if we do, they are usually eaten within a day or two. I wish we could bring it down lower, but prices in our area are high and when we’ve used conventional meat/dairy, we notice a negative difference in our health very quickly. I always say I’d rather spend my money on groceries than on medical bills. By feeding my family good food I know in the long run the money we spend on illnesses will be less. Great post and thanks for sharing the “real” numbers. Wow very brave! I typically spend about 40-60 dollars a week, depending on the week, where I shop and what I’ve bought, it’s like 200-250 dollars a month. Feels a bit scary putting it out there! But I’m doing my best and we don’t necessarily have tons of money to spend on food so we’re working with what we got. Definitely as my older son has gotten older and my youngest has started eating food, I’ve totally had to up my budget a bit. I think you are doing great with your spending! I live in the Midwest, so groceries aren’t crazy expensive like some areas. We are a family of 5, including boys ages 12, 10, and 8. My 12 year old is taller than my husband and I. We eat out once a week, and sometimes the boys buy lunch at school. I still spend an average of $900 a month. I used to spend much less, but these boys just keep growing and eating. I also work part time now, so I don’t spend as much time price comparing and I cook a little less from scratch than I used to. I do most f my shopping at Costco, Walmart, and Aldi. I’m not looking forward to car insurance in a few years, either. The idea makes me shudder. Right now our budget is extremely tight, and my grocery budget is $300 a month for 6 people, 2 adults, and 4 teenagers. Praying our grocery budget will increase soon, but in the meantime, I have to be really creative. Wow! That has to be tough! I try to spend under $400/month for 4 people. We used to have the same budget with 6 and a baby (my daughter, her husband and their baby were living here and moved away in the Spring.) I find it hard no matter how many coupons, price matches, etc I use. We eat very frugal meals (I’m eating a lunch of leftover chili as I type this)and sadly, right now not a lot of it is organic. I do have a grocery store nearby where I go on certain days of the week to get great deals on reduced dairy and sometimes meat. I have to catch it at just the right time though. I have managed to get a stockpile of organic butter in my freezer by doing this (11 pounds and counting!) I hope your situation changes soon. I will say a prayer!!! There are six of us. Two teenage boys, one swims two hours a day and the other runs 3-5 miles a day in cross country/ track. So almost year round very athletically involved. When we try to eat pretty healthy we can easily spend $300 a week on groceries. Easily. And, yes, car insurance for teenage boys is breath taking. Of course those are just estimates, averaged for the whole country. I’d say for your family size and the ages of your boys, you are still at the lower end of the spectrum. (I admit I didn’t do the math, it’s too early for *that*). That’s great considering you are really careful about buying only healthy food. Great job! Interesting! I did the math (geek!) and I’m spot on with the “thrifty” to “low cost” plans. That was fun to look at! We spend around $300-350 a month for four of us; my husband, myself, a four and a two year old. We do eat out usually once or twice a week so it would be slightly higher if we cut that out. I shop at aldi, our local grocery store, our local butcher shop, and Amazon for a few things. I hear ya on feeding boys. I remember my oldest 2 (now grown) getting up from the dinner table and looking for something to snack on. The second round of our family includes our 12 year old son, who has food allergies, so is more expensive to feed, and has suddenly become constantly ravenous. I try to keep it down to about $500/mo. but this is not easily done. We have a CSA, which is active from the middle of May through the end of November, I have a large Subscribe and Save order from Amazon, and I shop at both Whole Foods and Trader Joes. We eat about 90% or more organic. Our CSA is through an organic farm. I am a vegetarian, and my husband and son don’t eat a lot of meat, mostly chicken. We get eggs from church members with chickens. We get free cranberries from our cranberry farmer church members, who comprise a majority of our members. We pick a year’s worth of blueberries when they are in season, and my husband just found a customer of his who will let us pick all the apples we want for free. We are abundantly blessed. Your post made me feel so much better! While I cook most things from scratch, shop for sales, have a large garden, etc, our grocery bill has increased a lot in the last few years and is now generally $800-$1000 for our family of 5 (kids ages 15-20). Trying to be both frugal and healthy can be a challenge, but now I don’t feel like I’m doing so badly. Thanks! How do you feel about your oldest consuming food from the school cafeteria? When I was in college the cafeteria food was worlds apart from how I eat now. We stayed overnight at a Holiday Inn this weekend, where I “let” the kids partake in the continental breakfast. A wasteland of white, refined, sugary pastries, instant oatmeal, cereal, yogurt, etc. The only safe thing was fresh fruit. Needless to say 3 out of 5 of us complained of digestive issues later. I could have brought healthy breakfast food from home, but I didn’t want to be the mean mom depriving my kids. I was wondering the same things about the cafeteria. White flour, PEPSI, sugar, margarine! This may help some to look at it a bit differently. We are at $750/month for our family of 6. However, this does not include meat. We have a separate annual budget for meat. A local farmer supplies us with pork, chicken, and beef which we pay for quarterly. It was a stretch to switch to this method, but taking meat out of the monthly budget has kept our bill lower overall. Even before we found a local farmer I found that a separate meat budget allowed me to take better advantage of grocery store sales. And well stocked freezers has meant significantly less eating out! Karen–Can you explain a bit more how you do two separate budgets for regular groceries and for meat? We’re trying to save to buy 1/4 cow in October, and our grocery budget is really taking a hit. Melissa – I can try! It was a stretch to switch to this method, which took about a year. So hang in there! We saved some money out of the monthly budget and took some out of savings to pay for the first 1/4 beef. Then since the freezer was well stocked, I stopped buying beef at the grocery store. Instead, we set aside an amount of money into a separate budget for meat. Beans, rice, eggs, and potatoes were and still are great meal stretchers! When we had enough saved, we bought 20 chickens (already processed and frozen). Then I was no longer buying chicken or beef at the grocery store. We continued to set aside money every month for a bulk purchase of sausage and bacon (not enough freezer space for a portion of a hog). So are we really saving anything? To continue the transparency of others, you can see our regular grocery budget spending above. We try to average putting around $70/month into the meat budget, some months more, some months less. Life is like that. =) That is enough to pay for our meat in 4 payments per year (chicken gets paid for in two batches of 10). Monthly, that is less than $20/week for meat for a family of 6. No way could I get these quality meats for that price at the grocery stores in our area! Hopefully this helps clarify, blessings in your journey! We just took our oldest to college as well. Our oldest is a daughter that typically eats a single piece of fruit for breakfast and is full. I don’t think having her away at school will have any affect on our grocery budget! We still have 2 at home and one is a 16 year old son. He will probably eat her share and then some! I liked reading this! I am from a big city in Canada and I find grocery prices to be astonishing, and I cannot even afford to buy many things organic! Currently for just my husband and me, we average between $100-$180/week (this also includes household products if needed). My husband works from home and needs easy access to meals during the day and I currently work full-time (heading on mat-leave with our first this December). I hope when I am home I will be able to take better hold of our grocery budget and make sure I am cooking far more of our meals from scratch. Reading this gives me something to aspire to! Eight eaters in our family and I’m constantly shocked at how much it costs to feed us!! Whole Foods and Costco are an hour away. Otherwise I get produce from a neighborhood Walmart but the quality can be so terrible I go home empty-handed. Azure Standard finally delivers to south Louisiana so that’s helpful. I don’t know exactly what it costs to feed us a month but I’d guess $1,500 on average. I use our grocery money as wisely as I can but we have to eat real food and are beginning to figure out food intolerances. Wheat was very cheap and stretched meals but is now off-limits. And when baby starts eating next year and my children hit the teen years… Oh, my!! I would add to your list one thing. Buy fresh produce only when in season. Yes you can now get peaches, strawberries, asparagus, etc in the middle of winter but they are expensive because they have been shipped from overseas. And so they travel better most items are picked very early so have not had time to develop wonderful juicy goodness. And I find when our peak season rolls around it just makes me appreciate those fresh flavors all the more!!! We do much of our shopping at Trader Joes and Costco. I recently requested the catalog from Azure Standard but have not ordered yet. Occasionally I will order from Amazon. I have recently decided to start juicing multiple times per day to boost my immune system. Only have the one fridge so shopping will have to happen more frequently!! Just found this post today and found it so encouraging! Praise the Lord for your honesty! I’ve been growing frustrated by how I haven’t been able to keep my grocery budget in check like I used to about a year ago. It’s a relief to find others that cook similarly have similar grocery budgets! Here’s to feeding growing boys with decent food! My boys are currently 7, 6, 4, almost 3, and five weeks. We’re managing at about $400-450/month (up about $50/month since moving from Ohio to Minnesota). I can only imagine what it’ll be in ten years (or less!) We eat out more than we should, but some of that is life change (move/new baby) survival. And that’s a separate budget anyway.